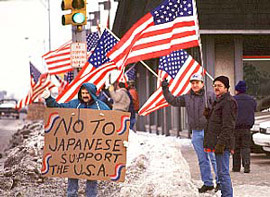 U.S. auto workers protest Japanese automobile imports. In 1980 the annual production of cars, trucks, and buses in Japan exceeded 10 million for the first time. In the same year the United States produced 8 million vehicles. As a result, Japan became the world’s largest automobile producer. An American company, General Motors, was still the largest company producing cars, but Toyota and Nissan followed GM, and Ford ranked fourth. However, in terms of sales value, American auto companies fared better than the Japanese, since the Japanese auto companies mainly sold compact cars and had to pay for patent fees held by American companies. Yet the American auto industry started to consider the Japanese companies as a major business threat. Indeed, Ford and the United Automobile Workers (UAW) brought a case to the US International Trade Commission (ITC), demanding tariffs for Japanese cars and requesting Japanese auto companies to produce cars within the United States. As a result, the Unite States and Japanese governments had official meetings, and the competition between auto companies became an international dispute.